Two Sisters Botánica is an online store that is owned and operated by authors and public speakers, Katrina and Eric Rasbold. For years, they offered their products at Botánica de La Reina and Two Sisters Botánica in Roseville, California, as well as at popular festivals in the Sacramento and El Dorado County areas of California. In October 2017, the Rasbolds closed their storefront to focus on the promotion of the CUSP spiritual process and their books. 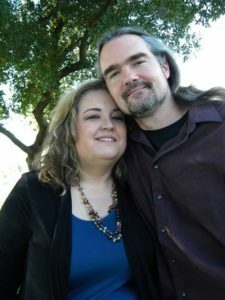 They lecture at Pantheacon in San Jose, California, as well as continuing to work the local festival circuit each year. 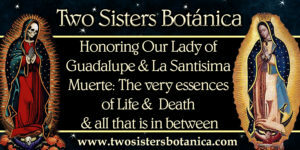 Who are the “Two Sisters” of Two Sisters Botánica? No, Two Sisters Botánica is not run by two actual sisters. 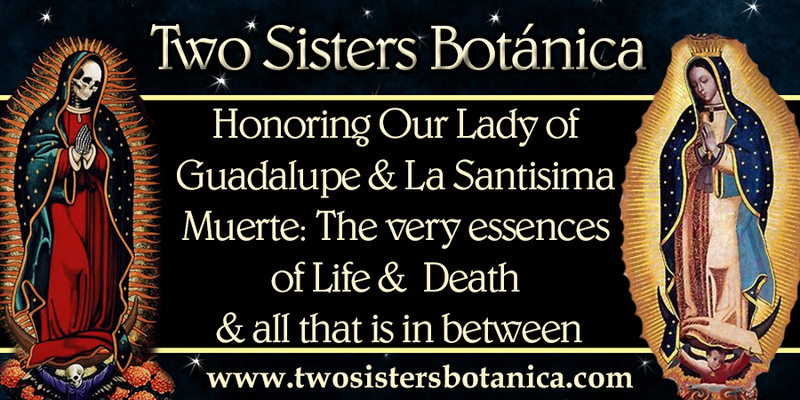 The name of our company honors La Santa Muerte and Our Lady of Guadalupe – the two “sisters” of death and life and all that lies between them. Raised around Appalachian magic, Katrina Rasbold began her magical training in England in 1981 and received her third level Craft initiation in 1991. Eric began his pursuit of magical studies in Korea in 1995. He and Katrina developed the CUSP (Climbing Up the Spiral Pathway) spiritual pathway in 1997 and have co-authored a total of ten books on the subject (The Bio-Universal Energy Series), starting with Energy Magic and CUSP. Both have studied a wide range of spiritual paths academically and experientially. Katrina is the author of thirty-five books, both fiction and nonfiction, including the ten she wrote with Eric. Her forthcoming book, Crossroads of Conjure, is through Llewellyn Worldwide publishers. Eric’s popular YouTube channel features instructional videos on a variety of magical subjects in both English and Spanish. Katrina’s video classes are available on her YouTube channel. Katrina and Eric personally create, bless, and empower most of the items available through Two Sisters Botánica. When you receive them, you will feel the buzz of energy flowing through them, ready to work for you. They also offer pictures, jewelry, pendulums, polished stones, curios, books, candles and candle holders, working bottles, aroma beads, wands, loose and stick incenses, smudging tools, handmade goats milk soaps, gris-gris, bags, powders, dirts, and other magical tools.